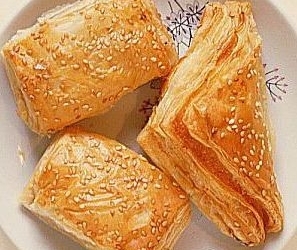 Burekas is an Israeli food recipe of stuffed puff pastries. Mix together the cheese and whole egg and set aside. Divide pastry dough in half. Roll out and stretch to form a large rectangle. Cut into 4-inch squares. Place a heaping spoonful of cheese mixture in the center of each square. Fold over to form a triangle. Pinch edges together firmly. 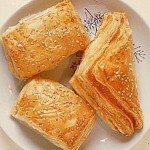 Beat egg yolk and water and brush tops of each pastry and sprinkle with sesame seeds. Bake on lightly greased cookie sheet at 350F until golden brown.